This is the travel report (or at least a selection of 360 photos, including 65 panoramic ones) for our California round trip in June 2009. We stayed in the great(er) San Francisco area for a few days, and then headed for Yosemite National Park for two multi-day hikes. Finally, we returned to San Francisco in a big loop along Mono Lake and through Death Valley to Los Angeles, and then north on Coastal Highway 1 through Santa Barbara, Monterey, and Half Moon Bay. Maps created at gpsvisualizer.com with background map data from NASA (left: ``Blue Marble'', right: Landsat 30m). Use the following links to go to the pictures of the respective day. 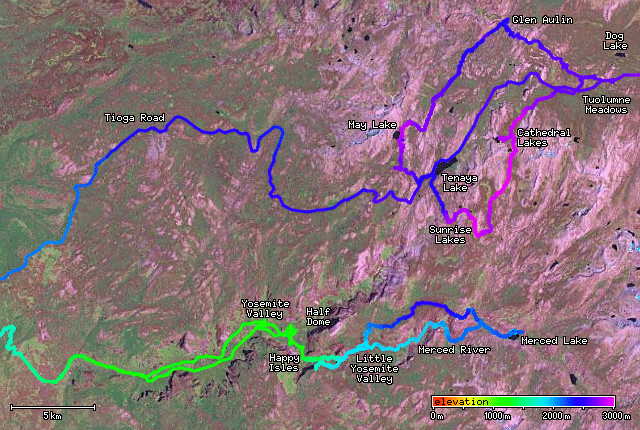 Places written in bold face indicate our two multi-day hiking segments. The other places we have visited by car or on a small day hike. This page shows all 65 panoramic images taken on our round trip, in chronological order. If you click on a small thumbnail picture, another browser window opens and shows the same picture in a bigger size. You can keep that window opened, as other pictures will also be shown there. You can also use the forward/back links in that window to look at all pictures. Don't forget to scroll right on panoramic images! Most picture captions provide coordinates and the elevation of the place the picture was taken at. Clicking the coordinates opens a map at maps.google.com, in which the picture location should be indicated. Note that there is a varying measuring error in the coordinates and the elevation, depending on the local quality of GPS satellite reception. The pictures with a number starting with the digit 2 have been taken with a Canon PowerShot S500; all other pictures with a Canon EOS 400D. Among my other travel reports there are two more covering California: USA 2000 and USA 2001. Comments, corrections, etc. are always welcome.